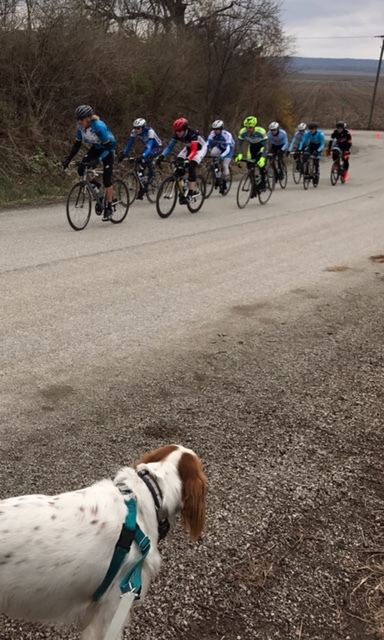 This entry was posted in Comments about Cycling on March 13, 2017 by Steve Tilford. The title to this post is true, but it wasn’t an ordinary race or race victory for me. I really had to work for it, which is pretty usual. And, really, I didn’t “deserve” to win the race, which is sometimes how bike racing goes. I am rarely the best athlete in the races I’ve won. Let me backtrack. About 5 months ago, really 5 months ago tomorrow, I crashed and fractured my skull. That wasn’t the big problem, still isn’t. The big problem was I injured my brain. It is called a traumatic brain injury, tbi, which I sort of disregarded initially, but since, feel it is the appropriate name. I was pretty out of it for a couple months. That is probably wrong too. It was more than that. I am still a little out of it, but not so much I can’t ride my bike. At least I can ride my bike around 5 mile circuits in the wind. I didn’t ride for for 2 1/2 months, then started riding a little. The last 2 months I’ve been riding pretty consistently and have felt pretty okay. It is sort of hard to explain, but I feel the best, of all the day, when I am riding. It doesn’t seem to add any to the “issues” I’m still experiencing. And the issues aren’t horrible. The issues are the “now normal” dizziness, which hasn’t happened riding for a long time. But it does happen when I move my head up and down quickly, not on the bike. With the dizziness, then nausea, which I’ve learned is a by-product of dizziness. I’m not so bad with that so much either. Oh, with dizziness, nausea, there are headaches. It is all interrelated. Then there is the no smell or taste problem. I don’t feel that I’m going to get the smell back. I don’t smell anything. I can taste some things, but if I didn’t know what I’m eating I couldn’t usually tell you. I went to a doctor that told me the majority of tbi’s he sees lose their taste and the majority of them get it back within a year. I’m holding out for that. Okay, this was a race report and it started out not being one. Anyway, I’ve been riding a lot the last couple weeks and was hoping to race. 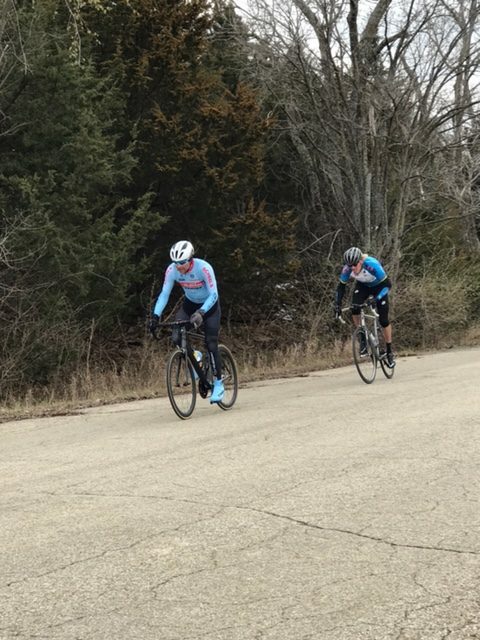 There is a local road race training series between Topeka and Lawrence, so that was perfect. I’ve ridden the race dozens of times. It is about 23 miles there from my house. Catherine, my brother Kris and I rode there. Trudi and Tucker drove. It wasn’t the best conditions. It has been super warm for the last month, but it snowed a couple days ago and stayed cold. Nothing on the road, it was dry, but it was breezy and cold, in the 30’s. I was surprised how nervous I was. I was nervous because I have been having off the bike issues the past few days. I feel pretty fine riding, but when I’m doing normal life it has been a problem, which makes the days odd. I felt mediocre riding over, but just figured it is what it is. There were less than 20 guys in the 1/2 race. It was a small field, but very good riders. I think they allowed 3’s too, but I don’t think there were many of them. As usual, my brother rolled off the front as soon as we clipped in. The race starts at the top of a climb and goes downhill to a long, wind exposed dam. Early during the first lap, a few more guys rolled away. Pretty soon there is a 5 rider group up the road 300 meters. The Olathe-Subaru guys had 2 guys in the break and 4 more in the field, so they didn’t have any interest in chasing. Joseph Schmalz, Elevate Pro, went to the front and I realized that he wasn’t going to be able to chase it down himself without expending a ton of energy. So I went up and we chased for the next 20 minutes. I was feeling bad, but I didn’t care. I was using the race to try to get some harder efforts in. Joseph had been doing intervals the whole week and was a little gassed from training so hard. It wasn’t a perfect match. Anyway, we eventually caught the break and almost immediately, Hunter Adams jumped away. Hunter is from Topeka and is quick. He got a huge gap pretty quickly and then Andy Chocha, Olathe-Subaru, jumped trying to bridge. And the field shut down. Hunter, with Andy chasing, disappeared up the road. Finally, a lap later, which is maybe the 3rd out of 7, we started racing again. I was already hurting every time there was a big acceleration. Each jump was one more jump than I’ve done in 5 months. There was a lot of gutter riding because of the strong SSE wind. Before the climb, maybe the 4th time up, it started going fast and I got strung off the back, along with about 1/2 the field. We turned the corner to start the 1/2 mile climb and I was hurt. Garrick Valverde, Olathe-Subaru was driving it up the hill and Joseph was chasing from behind. 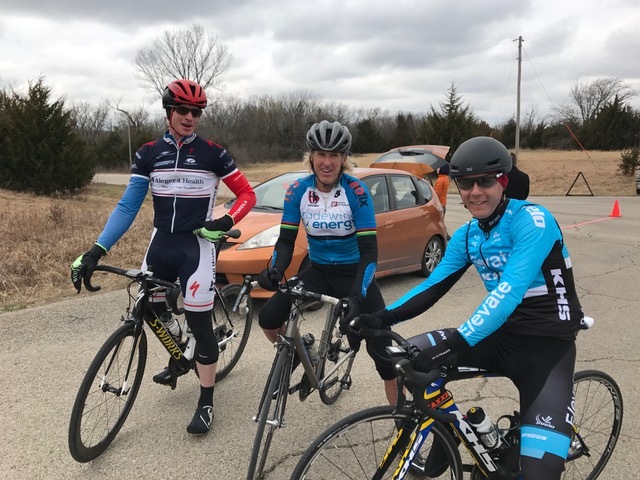 I was in no man’s land, along with my friend, Shadd Smith, who happens to ride for Olathe-Subaru too. We got to the top of the climb and were pretty gapped. Shadd pedaled down the descent and I lost him tucking. At the bottom of the descent, there is a long open dam. Shadd was going so hard, about 200 meters behind a group of 7, who were rotating. I could do nothing. I tried to get by Shadd once, but realized it would just slow him down. About 3/4’s the way across the dam, the front group slowed some. My contribution to the chase was telling Shadd that they are sitting up. We rolled back on after about 1/2 a lap. Then it went into the gutter again and I was barely able to stay on. We’d caught Andy and were all rotating through and then catch Hunter. So, two laps to go and groupo compacto. Coming to the hill for the bell I thought that I’d better be ahead because I didn’t think I could stay with Garrick or Joseph on the climb. So I jumped and Michael Allison, Subaru again, followed. Then I immediately went again and Scott Williamson, Olathe-Subaru came along and no one else. His team had about 1/2 off the remaining field and I just put my head down and led the climb. Scott had been gapped when Shadd and I were chasing, but Scott had spent an extra lap on his own. It was pretty amazing he had caught back on alone. I coasted the descent and only had 5 miles to ride. We had a huge gap and about half way across the dam, Scott took a fast hard pull. He was way stronger than I on the flats, but I knew he must be tired from the chase. We kept going and approached the hill with a healthy lead. I had a game plan of going from the bottom and making the whole climb as hard as possible. So, after the corner, I accelerated and just kept going. Scott got on and followed me up the first pitch. It levels out for a 100 meters and then a steeper, final pitch. I kept the pressure on and jumped up the steep pitch. I looked back and had shelled Scott, which was good, because Scott is super fast and can out sprint me easily. So, I won by myself. Scott rolled in a few seconds behind me and then, just a few bike lengths behind him were Joseph, who had gapped Garrick. They both went up the final climb super fast. Okay, this is getting long. I was pretty lucky. 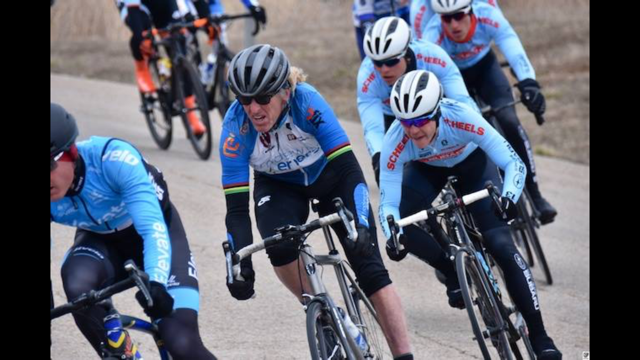 I wasn’t close to the best guy there, but that is how bike racing goes sometimes. I was really just jumping for self-preservation, not for a winning move. But, again, that is sometime how bike racing goes. I never would have been in that position without Shadd. He and I go way back and he is still pretty fit from cross season. I was lucky he’d just took a big pull before Garrick and gang went or I would have been alone and never caught back on. I know nearly everyone in the race, so it wasn’t like a normal race. Most of them had ridden over from Lawrence, so we all were ended up with around 80 miles for the day. It was just early season racing in the wind. And I got lucky. I was thinking about it a couple days ago if I was going to win a race this year. A 1/2 race. Normally, early season, I’m in pretty good form and can go pretty well, but like I found out, I’m pretty much behind, at least I feel the pain more. I’ve won a 1/2 race, usually a lot more, every year I’ve raced since I was 15. That is a long time. I was thinking this year might break the streak, not that it really is an important one, but it is what it is. Now I don’t have to think about that again for a while. It is weird, but my wattage was pretty incredible. Wind and hills adds big to wattage. 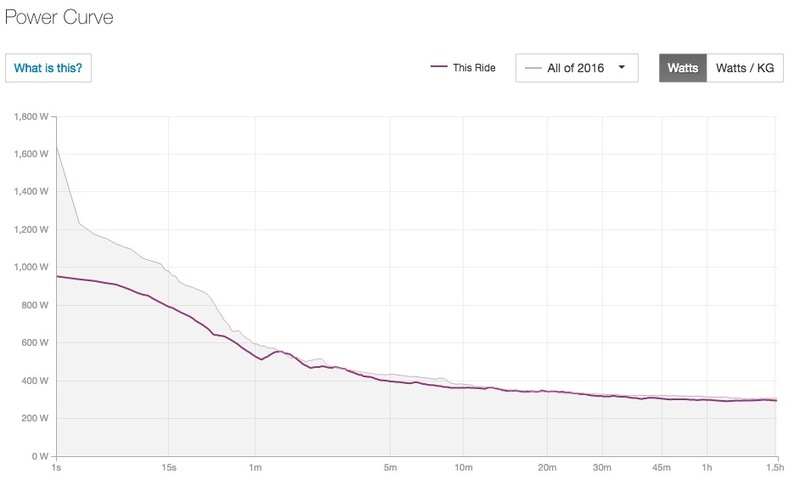 Since I rode the first 10 + miles in the wind and then the last 6, I had pretty crazy wattage numbers. If it hadn’t eased up for a couple laps, I think they would have been “records”. I was at 390 NP for the first 20 minutes and 340 watt average. That is higher than all of 2016 and nearly as high as 2015. I was over 300 watts for the whole 37 miles, which is high considering. But, it was way more painful. Maybe I’m just in shape enough so I’m suffering. I talked to a couple other guys and they said their wattage was super high too. Guess it was the wind. It was slow, but hard. After the race, Kris, Catherine and I rode home. Kris ditched us, looking for a work glove he’d seen on the way over, but he couldn’t find it. We took a gravel shortcut, so saved 4 miles. It was still windy and cold, so the shorter the better. It was still 77 miles for the day. I had 466 miles for the week, so pretty good mileage. I don’t feel all that tired today, but it is only supposed to be a high of 40. The first club ride is tonight, since yesterday was the daylight savings time switch. We’re riding at 5:30 for a couple hours. I’ll probably just do the club ride. I’m a little up in the air about what my plan should be now. Okay, sorry about length here. Kind of just picked things out of my head. Maybe it is the tbi or probably, more likely, just how I think. Tucker watching the race early on. Me following Joseph, with a bunch of the Olathe-Subaru guys following me. Me trying to stay with Shadd on the hill. Scott and I with a lap to go. Was thinking I shouldn’t but put my arms up anyway. John Borstelmann, fast guy from Lincoln, myself and Joseph. Power from yesterday compared to all of 2016. Felt hard, but not that hard. Way to go, your back to racing and winning! Fun to read. Now that is a great bike story and one many of your followers have been waiting to hear. Way to crush it Steve. Congratulations Steve. So glad your recovery is nearly complete. You are unbelievable (in a completely good way). Congratulations and I hope you keep winning for years to come! Thanks Steve. That was fun. Thankful you can ride and write again. Enjoy the ride. Definitely not too long; the blow-by-blow was better than being there as a spectator. I loved hearing that Kris tried to find the glove; such a real-life detail in an all-around great story. Congrats on the win but I never want to hear any more whining about how windy it is in Kansas. Although ironic, it’s 100% true. Shadd, Scott and Joseph were racing for 2nd place from the moment they got dressed. Kudos on your return! That is so great to hear. 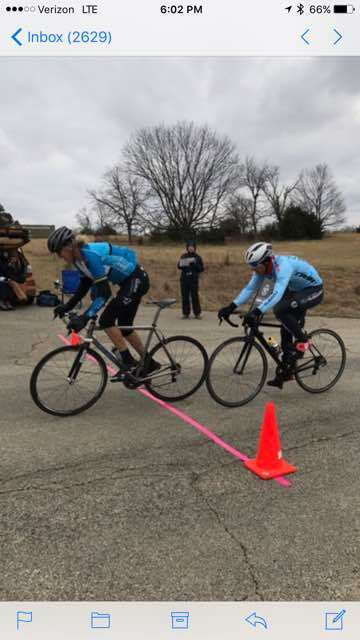 After suffering a severe concussion two years ago, it took me a year and a half to get back the nerve to compete on any level again, and that was just cyclocross training races. I also admit to not feeling at all like my “old” self these days, with still some vague vision, hearing and balance issues, but I feel lucky, too, and have a great life. I still cannot handle stress like I used to, also. And, like you, I feel pretty awesome on the bike, any lingering symptoms go away, especially at race pace. I bet a lot of the lingering stuff for you will eventually, mostly, resolve. It just takes time! Hard exercise is a huge help for recovery at your stage of the game. Beautiful. Congrats! Love that course. 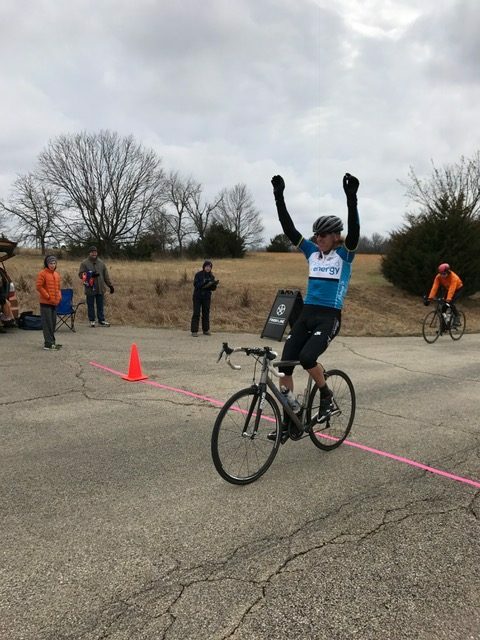 Definitely an “arms up” victory and not just the biking. Congrats Steve. Happy for you. Congrats first race back from your injury and you win!…insane big engine! omg.. i felt some warmed when you finally raced and won. Don’t call it a come back, cause I’ve never been gone….. Your recollection of the race is pretty awesome for someone with a brain injury! Congrats! Your writing has definitely improved over the past few months. Lots of small and interesting insights. Good sign of recovery!